November 9, 2009 Dan O. Honestly could this title get any more catchier??!! 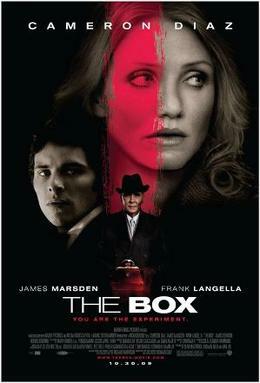 A disfigured NASA employee named Arlington Steward (Frank Langella) informs Norma (Cameron Diaz) and Arthur (James Mardsen) Lewis that they have 24 hours to decide if they want to push a button inside a box that will give them a cool million — but a complete stranger will die at the same time. When I first found out that this movie was directed by Richard Kelly, who directed one of my favorites Donnie Darko, I was actually a little excited to see it. Basically Donnie Darko’s whole story is basically making fun of the horror film genre but putting more goofier stuff into it, but making it a better film all together. This film not so much. To first start off the plot is really simple. You push the button, and someone dies right? Well yes, that happens but then out of nowhere it gets out of control with weird staring people, and secret alien organizations. The film gets a little too out of control, and gets really crazy. Mostly I just found myself laughing at it sometimes. There are just some scenes that look and sound hilarious. The way events happen in this film are very strange, and will really make you laugh. Another thing that made Donnie Darko so good that it wasn’t afraid to push a little bit of buttons with it’s fact of being raunchy, and a very controversial script. This film doesn’t do that at all. Yeah there are some scenes that could’ve given it an R-rating but it doesn’t go too far and in the end I feel like it was too afraid to go anywhere. It’s script is also very cliched, with a lot of the same lines already used in a lot of recent horror films, that I could’ve sworn I’ve heard already. I really liked how the story was actually original and was interesting, but also imaginative, which kept me glued to the seat. Though at some points I was wondering what was going on, I couldn’t help but still watch and find out what happens in the end. The cast does a pretty good job in this film as well. Mardsen and Diaz are very believable as a couple although they rarely show love, but the one who really stands out is Frank Langella. Langella does a very good job at being an actually creepy villian that isn’t very new, but also one that your terrified at overall. Consensus: The Box is imaginative and interesting, but becomes too unintentionally funny and gets too out-of-hand with no basic message like Donnie Darko. We saw this a few hours ago, and considered a waste of money. It was intriguing that’s what made us see it, but it did get really crazy in the middle and we were unable to follow the crazy plot. the part I did like very much was the retro setting throughout the whole movie, and the villain’s acting role.